Senator Rob McColley (R-Napoleon) is joined by his wife and daughter as he takes the oath of office for Ohio's 133rd General Assembly. 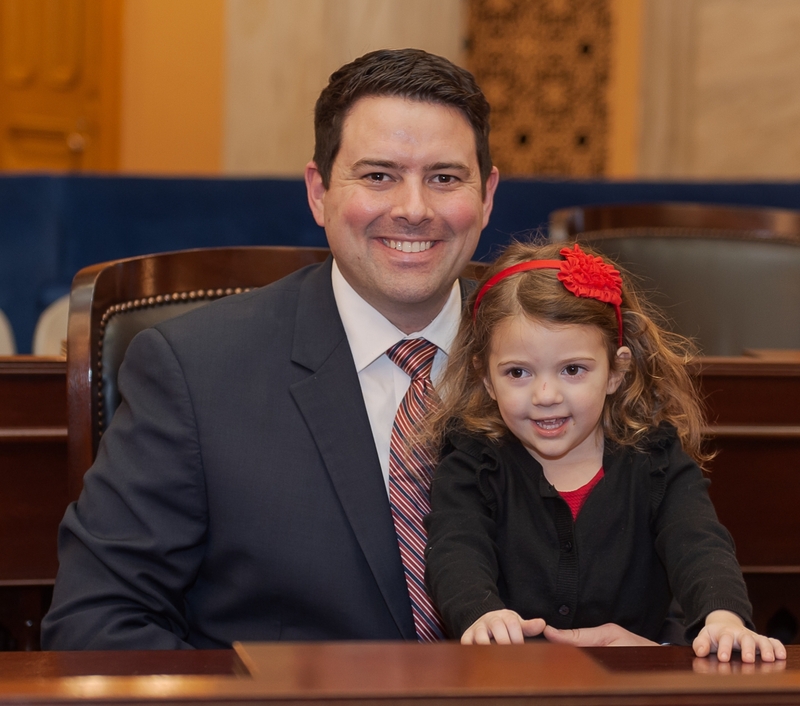 Senator McColley spending time with his daughter on the Senate Floor. Senator McColley welcoming former Ohio House colleague, Senator Manning, to his new position in the Ohio Senate. 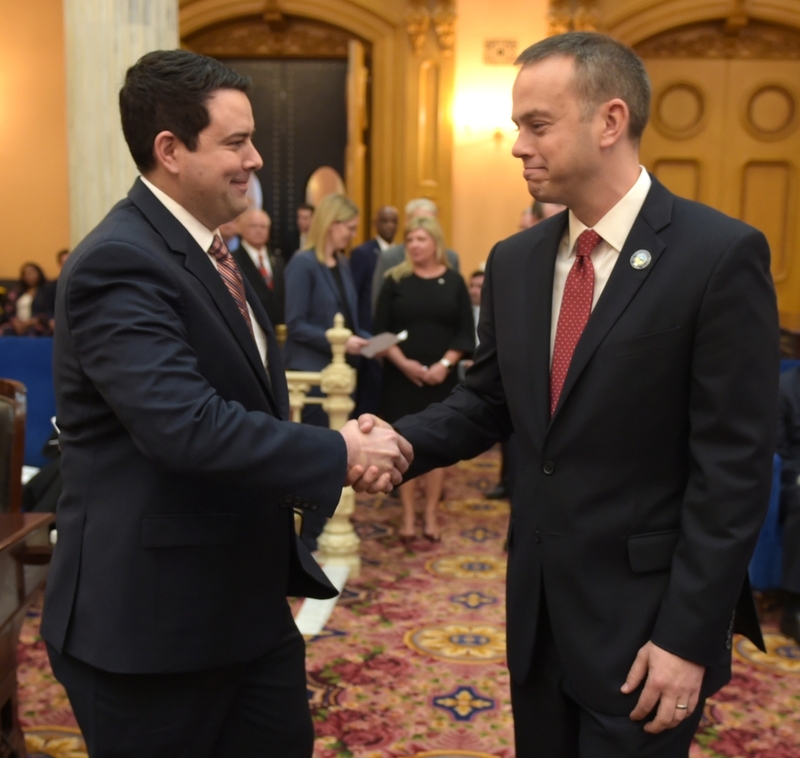 COLUMBUS—State Senator Robert McColley (R-Napoleon) on Monday was sworn in by Ohio Supreme Court Justice Judith L. French, to serve his first full four-year term as Senator for Ohio's 1st Senate District. Prior to his election, McColley was chosen by his colleagues to serve the remainder of the term to fill the vacancy in the district. 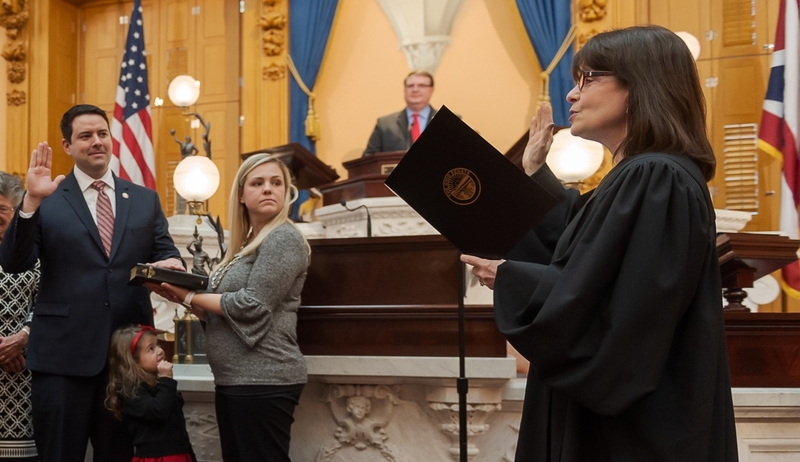 "I am humbled to once again be trusted by my constituents to represent them in the Ohio Senate. I look forward to continuing to work with the people of northwest Ohio to eliminate burdensome regulations on businesses and further promote a pro-growth regulatory environment," said McColley. "I want to once again thank my constituents for giving me the opportunity to serve them and help continue improving the 1st Senate District. I also look forward to working with my colleagues to prioritize issues that protect individual liberties and promote economic growth." Before moving to the Senate, McColley previously served two terms representing the 81st House District, where he had the privilege to hold a leadership position as the Assistant Majority Whip. During his time in the legislature, Senator McColley has enacted legislation aimed at standing up for personal liberty in the form of the Civil Asset Forfeiture Reform in HB 347. McColley recently removed needless barriers to entry and anti-competitive regulations from our occupational licensing system through Senate Bill 255. Additionally, he plans to reintroduce legislation from the 132nd General Assembly to slash regulations in our state agencies for a more efficient government. Prior to being elected to the legislature, Senator McColley served in the Community Improvement Corporation of Henry County, where he oversaw economic development efforts for the county and worked to improve local workforce development efforts between manufacturers and schools in Henry and Williams counties. He was a former trustee of the Ohio Fallen Heroes Memorial, a trustee of the Henry County Community Foundation, board member for the Henry County Board of Developmental Disabilities, a member of the OSU Alumni Club of Northwest Ohio, and a board member of the Center for Child and Family Advocacy. Senator McColley lives in Napoleon with his wife, Denise, and their three children.